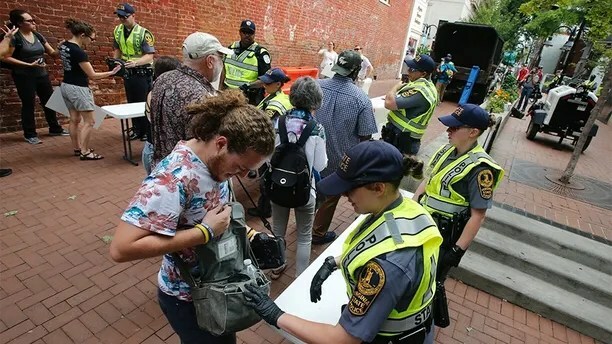 Anniversary events organized in Charlottesville, Va., were ongoing Saturday, in recognition of one year passing since a Unite the Right rally there turned violent. the day’s itinerary were several remembrance events, including a “morning of reflection and renewal,” a poetry session, and an appearance by University of Virginia President James Ryan, who was on deck to speak. A “Rally for Justice” was also scheduled in the evening. There was a significant police presence in the city in anticipation of the day’s events, with hundreds of people arriving by the afternoon, according to the city. Some activists began chanting at police officers, however, upset over the amount of law enforcement there. “Why are you in riot gear? We don’t see no riot here,” activists said. 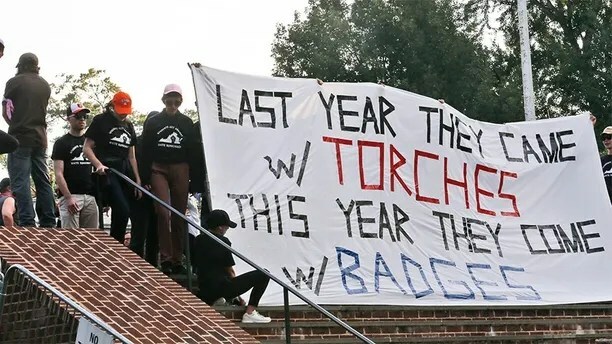 Roughly 200 protesters relocated their group to a different area of the college grounds, which was done because they didn’t want to be “caged” in their original spot, Kibiriti Majuto, a coordinator for UVA Students United, told The Associated Press. Majuto argued that officers hadn’t been “on our side” last year. 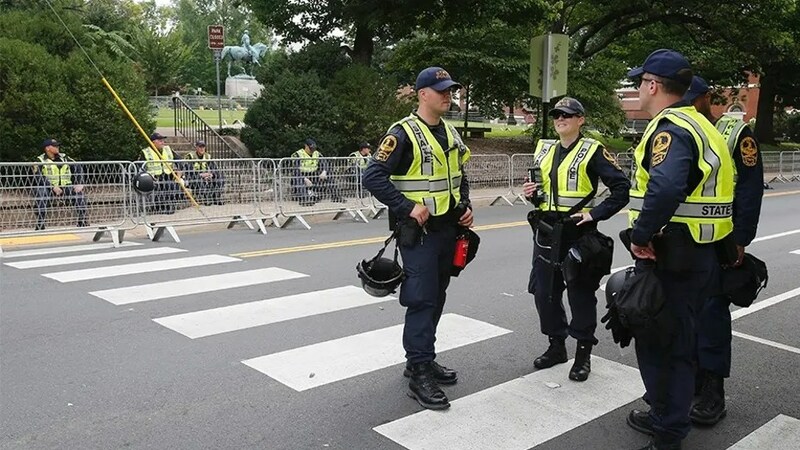 The first Unite the Right rally was held on Aug. 12, 2017. 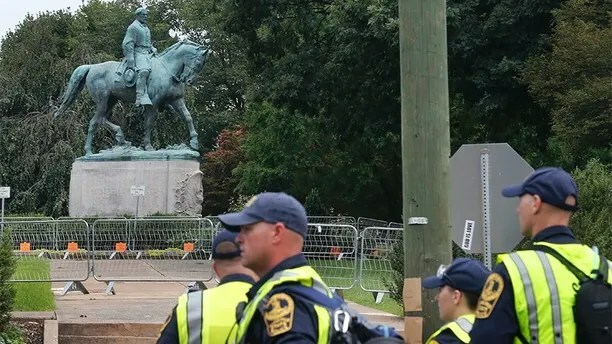 White nationalists arrived in Charlottesville to demonstrate against the removal of a statue of Confederate Gen. Robert E. Lee. The rally turned violent as protesters clashed with counterprotesters, ultimately resulting in the death of Heather Heyer, 32. Heyer was killed when a person drove a car through a crowd of counterprotesters. Heyer’s mother, Susan Bro, told The Associated Press that she’d been dreading the first anniversary of her daughter’s death and compared losing a child to standing in shallow water as waves repeatedly roll in. Earlier Saturday, authorities established concrete barriers and metal fences and police were searching bags at checkpoints. Three men were taken into custody by police around the secured perimeter, accused of trespassing, possessing prohibited items and being drunk in public, the city said in a news release. “The riots in Charlottesville a year ago resulted in senseless death and division. We must come together as a nation. I condemn all types of racism and acts of violence. Peace to ALL Americans!” he tweeted. Saturday’s events in Charlottesville precede a planned “white civil rights” rally set for Sunday in Washington, D.C. The demonstration was planned by Jason Kessler, who also organized last year’s rally.